Osmonds Slurry Boss is a cost effective Slurry solution that helps to promote the breakdown of solids and reduce toxic gas and odour production, thus dramatically reducing smells. Osmonds Slurry Boss breaks down the solids within slurry, making it easier and less expensive to pump, mix and spread. 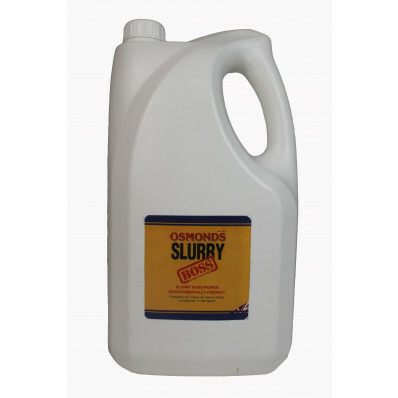 With no bacteria or enzymes, Osmonds Slurry Boss is non-toxic when used at the recommended dilution. Osmonds Slurry Boss is easy to apply and cost effective. Slurry Boss contains Copper in a highly soluble form which is not precipitated - it interacts with the enzyme systems of the millions of bacteria present in Slurry, activating some and inhibiting others. Check that pH of Slurry us between 5.5 and 7.5. Multiply the length x depth x width in metres of the Slurry Pit to get the usable volume in cubic metres. Divide this figure by 60 to get the amount in litres of Slurry Boss required. Slurry Boss may be applied neat or diluted with one or two volumes of clean water. Add Slurry Boss directly to the liquid portion of the Slurry (i.e. under the crust). In large facilities, add in several locations, again ensuring the product is added to the liquid portion. One litre of Slurry Boss if sufficient for 60,000 litres of Slurry.